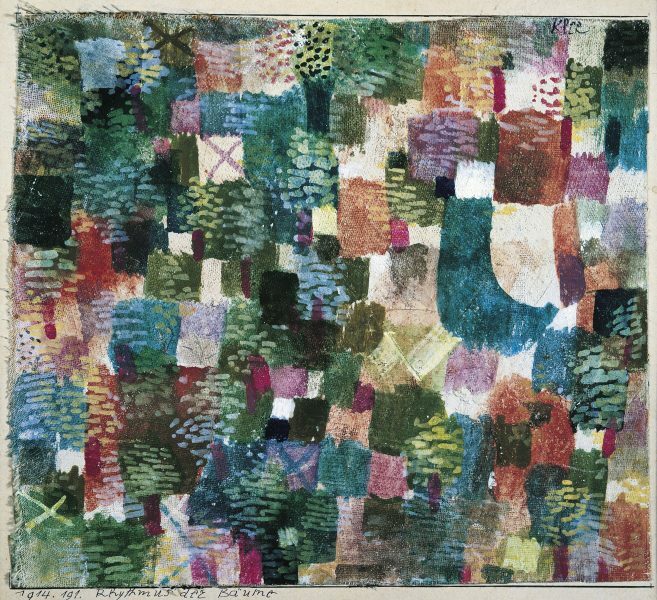 Detail from Rhythm of the Forest by Paul Klee (1914), watercolor on ecru cotton coated with plaster, 17cm ×20cm (Musée d’Art et Histoire, Geneva). 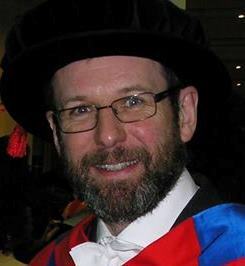 Today is the last day of teaching term at Maynooth University. My last lecture, a revision lecture, was yesterday morning and I spent most of the afternoon helping students put the finishing touches on their project work, which is due in on Tuesday next week. Next Monday is a bank holiday in Ireland (as it is in the UK), then there’s a short period of private study before the examinations start next Friday. As it happens, the theory paper for the module I’ve been teaching on Computational Physics is on the first day of the examination period. It’s `Study Week’ in Cardiff next week too, and I have a revision lecture there. Owing to the Monday holiday we’ve juggled the schedule a bit to ensure all modules have a revision lecture so I’m doing my revision lecture on Thursday rather than the usual Tuesday. I have a meeting at the Institute of Physics in London on Tuesday and it’s the Annual General Meeting of the Royal Astronomical Society (also in London) on Friday so I’ll be spending all of next week in the UK, in between Cardiff and London. Since teaching is over I’m not planning any more midweek travel (unless it’s absolutely necessary) and intend to spend one week in the UK and one week in Ireland, and so on, apart from conferences and the like, until I fully relocate in July. I thought I’d mention another thing, which represents a fortuitous bit of timing. Twenty-five years ago, while I was living in London, I took out a savings policy of the sort that involves making a regular monthly payment into a mixture of investment funds. The term of this policy was 25 years, and the maturity date was 23rd April 2018. On a couple of occasions I have been tempted to cash it in early but decided to let it run until maturity. The performance of my chosen funds has fluctuated over the last two and a half decades, but when the price of units drops and you invest a fixed cash amount you end up buying more units than when they’re expensive so if they do recover in value you do well. This is called Pound Cost Averaging. However, when a policy like this reaches the end of its term the amount you get back depends on the value of the units on the day that it matures. Although my policy wasn’t doing at all well a decade ago, it seems my portfolio (more by luck than judgement) has done well over the last ten years, but with the stock market being rather volatile in the early part of this year it’s been a bit of a white knuckle ride recently. Thankfully the last few weeks seem to have been more stable, and although the units are not at an all-time high in terms of value they were not far off that when they were cashed in. aturity value turned out to be about three times the total amount I’ve invested. I received the money on 30th April, and the proceeds will make a significant contribution to the cost of purchasing a house here in Ireland. The downside of pound cost averaging is that the final sum is paid in pounds to a UK bank account, and with the pound languishing against the euro there’s now a decision to be made about when to transfer it to Ireland..